Shoe where the noses of the quarter can be spread far apart to make the shoe easier to put on. 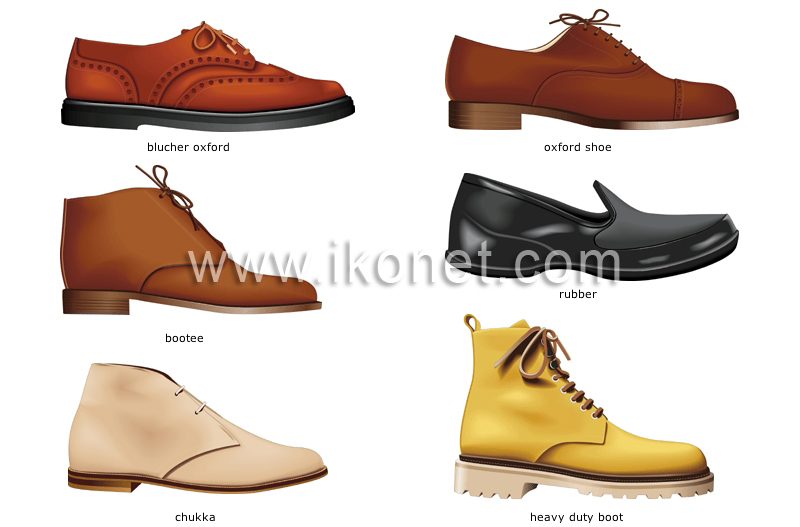 Sturdy shoe, with a thick nonskid sole, that comes up to the ankle and is tied with laces. Overshoe made of relatively thin rubber that protects the shoe from mud and water. Ankle-high shoe made of light unlined suede or leather and fastened with laces with two or three sets of eyelets. Shoe often lined with fur, that covers the ankle. Shoe where the top of the nose of the quarter is attached to the vamp, so that only the upper part of the lacing system opens for the foot to slip in.